We are a paramount organization that manufactures, supplies and exports a vast assortment of Nurse Call Systems. 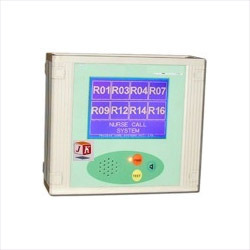 These micro controller based audio/visual alarm systems are manufactured employing advanced technology following industry standards and norms. Our range invokes positive response from a nurse just by a key press from a patient's room. Furthermore, we customize these products as per the specifications detailed by customers at nominal prices. We are one of the leading organizations that is involved in manufacturing, supplying and exporting a broad spectrum of Nurse Calling Systems. Manufactured using high - grade material, our product - line is in compliance with international quality standards. These systems are extensively used in hospitals / clinics for immediate service request from patients room/bed to duty nurse room. We are dedicatedly engaged in manufacturing, supplying and exporting an extensive range of Nurse Call Systems. These products are manufactured under the close supervision of our experienced & qualified professionals. High-grade material that is sourced from vendors of high repute is used in the manufacturing process. Our range is used in small nursing homes and large institutional hospitals.